With Collector for ArcGIS, crews at Vilnius Energy report information from the field into the company's dashboard faster and more accurately. Vilnius Energy provides centralized heating to more than 195,000 apartments, companies, and organizations in the capital of Lithuania. The utility, known in Lithuanian as Vilniaus energija, aims to give all customers in its 430-mile (700-kilometer) network uninterrupted heat and hot water while minimizing costs and keeping pace with changing environmental factors. To accomplish this, the company needed a central view of its heating network. 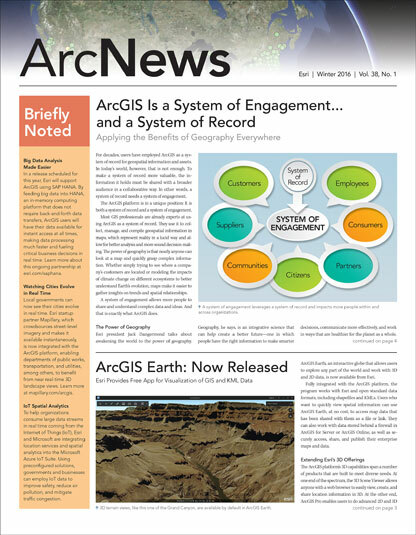 That required real-time geospatial information, which is why the utility implemented the ArcGIS platform with a focus on mobile GIS. After having used ArcGIS for Desktop for more than a decade, the GIS team implemented the full Esri platform—including ArcGIS for Server and ArcGIS Online—between 2010 and 2012. At the time, the utility had a big database of technical information, but the data was kept in different places and displayed in various formats. There was no aggregate view of the network. The GIS team transferred its existing map of documented heat chamber defects into a digital map, which allowed Vilnius Energy to audit critical points in the network and see where to focus its resources. But the data itself had been compiled over the course of a year, so there was no real-time vision of network needs. When Esri released Collector for ArcGIS and Operations Dashboard for ArcGIS, Vilnius Energy chose to use these to build its real-time heat supply view. To allow crews to quickly access, edit, and gather defect data in the field, the utility’s GIS team configured mobile GIS first. This relieved fieldworkers from having to spend substantial amounts of time completing paper reports; it also curbed redundant data entry and cut down on mistakes. During a mobile GIS test period, fieldworkers reported increased efficiency when it came to filling out service orders, making repairs, and fixing breakages. With data coming in faster and more accurately from the field, the challenge was no longer getting the data; it was capturing and acting on that information in real time. The GIS team configured Operations Dashboard to show data in a way that made decision making easy—with the latest information displayed ahead of historical records. 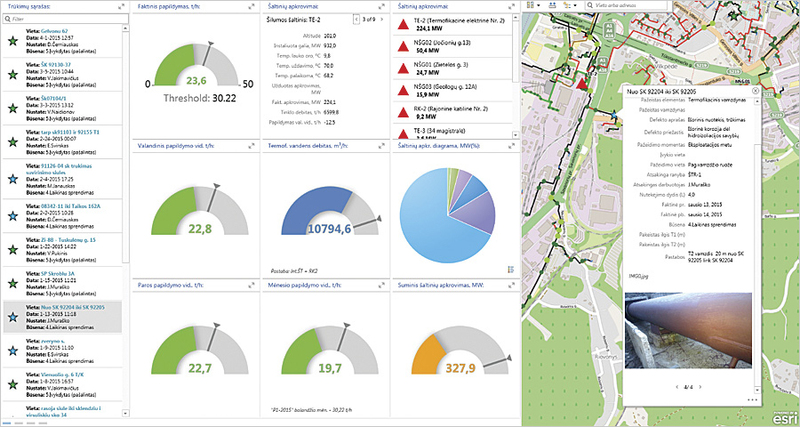 Decision makers at Vilnius Energy use the Collector and Operations Dashboard apps-based system to prioritize short- and long-term maintenance orders. They plan with greater purpose, targeting their workforce’s efforts to spots that need the most attention. Vilnius Energy integrated Operations Dashboard with a supervisory control and data acquisition (SCADA) system, which lets managers determine the company’s efficiency by tracking and controlling network operations. Initially, the utility planned for only top-level managers to access Operations Dashboard. But that changed. The GIS team integrated Operations Dashboard with Wonderware, a SCADA system that lets Vilnius Energy track and control electricity consumption in pump house heaters. It is also currently working on incorporating the ArcGIS program with two more systems: TERMIS, an energy network simulation system that makes it easier to analyze and manage heat loss, and CRM, a system to help the utility evaluate customer needs and expand to new clients. Implementing this mobile GIS along with Operations Dashboard has enabled Vilnius Energy to plan work according to its relative importance, fulfilling the most important work orders first. Thus, using its workforce more efficiently allows the company to provide continuous heating services to its customers.